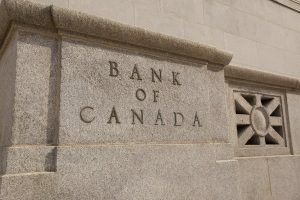 As was widely expected, the Bank of Canada announced another quarter-point interest rate increase this morning, saying that more hikes are ahead. According to Governor Stephen Poloz, the “big cloud” over the Canadian economy is the uncertainty associated with NAFTA and he cautioned that it would be some time before interest rates return to normal levels as some monetary stimulus remains warranted. Exports have been weaker than expected. NAFTA uncertainty is “weighing increasingly” on Canada’s economic outlook as cross-border shifts in auto production are already beginning. Consumption and housing will slow due to higher interest rates and new mortgage guidelines. According to today’s Monetary Policy Report (MPR), “growth of household credit has slowed somewhat since the first half of 2017, even though some households may have pulled forward borrowing in anticipation of the new B-20 guidelines related to mortgage underwriting from the Office of the Superintendent of Financial Institutions (OSFI). This slowing is consistent with higher borrowing costs due to the two policy rate increases in 2017.” Home sales increased considerably in the fourth quarter in advance of the tightening OSFI mortgage rules implemented beginning this year. The Bank of Canada’s future actions will continue to be data dependent. The next policy announcement is on March 7.